So suddenly the temperature has plummeted, and I’m faced with the dilemma of “what to wear when I go running”. 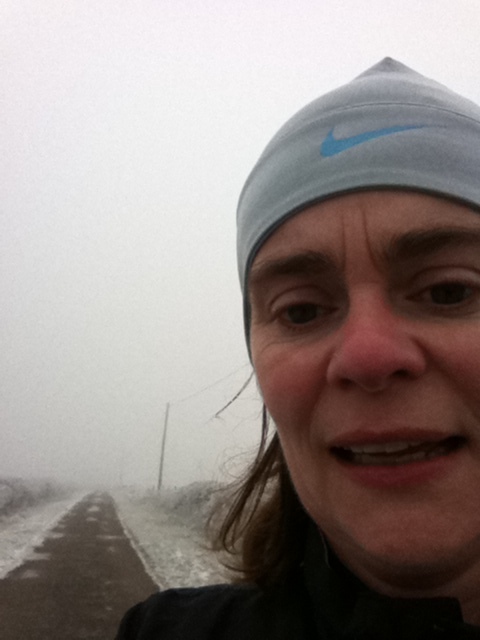 Not enough clothes and I’m miserably cold all the way round, too many and I’m red faced and sweating after a mile. I normally manage to gauge it about right, with pockets in my gilet for discarded hat and gloves, and many convenient hedges for stashing jackets and top layers in for collection later in the day.Once the temperature falls low enough to need some kind of hat however, then I’m really stumped. Never having been a dedicated follower of fashion, I thought I had long since stopped worrying about how I looked when running. Then the head gear appeared. My first option is a hat from a hat and gloves set by Nike. 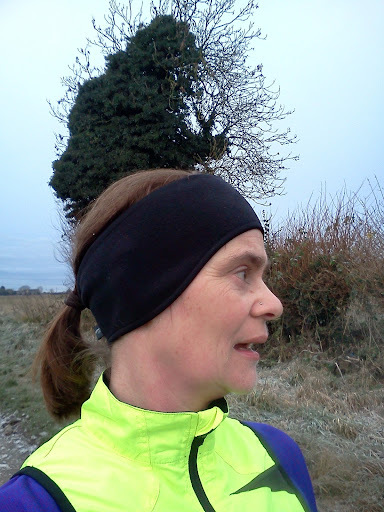 Its light (so great for stuffing in a pocket when you no longer need it), does keep your head and ears warm to a certain degree. However, it does make me look like I have an egghead, and not in a good way. Second option is the attractive 80’s style fleece headband. Main problem with this, is knowing quite how to wear it. Wearing it under hair without bobble is a no-no for someone with a low hairline like me. Wearing it under a ponytail (as pictured) makes my pony tail look more like a rats tail. Wearing it over the top of my hair, 80’s tennis player style, looks okay at first (think swish skier look). However after 5 minutes it gives me a curious ‘mushroom hair’ look. So, all of the above look ridiculous. However, the secret between you and me is, they are all actually really quite toasty around the ol’ lug ‘oles. And that’s all that really matters.